"More than a church ... a refuge"
"My friend goes to that church and I wanted her to be able to keep going there"
I wanted to send money because I wanted to help the church. I had saved money from the tooth fairy and from cleaning out the car so I wanted to help the people at the church. I know God would appreciate that. My friend goes to that church and I wanted her to be able to keep going there. For 81-year-old Vita Hernandez Chávez, the answer was a matter of honoring a central figure of her faith and culture. Mary the Mother of God, in her only appearance in this hemisphere, blessed this world with her presence over four days in December 1531 to an Indian man, Juan Diego. He had been widowed from his wife, cared for his sick uncle and survived the Spanish Conquest that butchered tens of thousands of indigenous people. St. Juan Diego also survived the local Aztecs, who sacrificed hundreds of thousands of lives for years in worship of a serpent God. 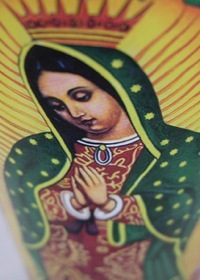 Into this evil, Our Lady of Guadalupe with her dark skin appeared at a hilltop wasteland five miles north of Mexico City. She promised to be a protectress. And as Pope John Paul II noted almost five centuries later, her appearance was meant to unite the European and indigenous people. The Spaniards came to Mexico and the New World at the direction of Spain's Queen Isabella. 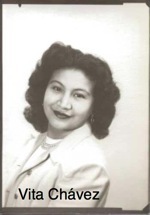 And Vita as a Mexican-American was descended from Juan Diego and the indigenous people. 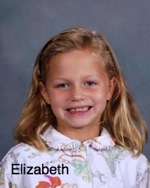 So within weeks of one another, Elizabeth from Overbrook School gave all she had, $7, and Vita from her Oklahoma City nursing home bed gave $7,000 -- both sums to keep open Our Lady of Guadalupe Catholic Church in Nashville. One inspired the other. And Europe and Mexico were united by Our Lady of Guadalupe according to John Paul's vision. For the past 45 days, raising funds to save Our Lady's has been difficult approaching a June 30 deadline to pay off the church's debt in an economic recession. But the miraculous acts of giving like those of Elizabeth and Vita have inspired advocates onward. Sunday, Father Fernando Garcia and parishoners of Our Lady's hosted Nashville, opening their doors Sunday afternoon to give tours and cook food for more than 100 Anglo brothers and sisters united by a love for Our Lady of Guadalupe and her son, Jesus Christ. One set of people had given and one set had of people received, and they showed off the marvelous things they have done with this investment. With their own sweat, they've refurbished the former Baptist church and molded young minds in the faith of generations since St. Juan Diego. Incredible. And to see the pride on these Hispanic faces was priceless and worth so much more to the heart than the despair in fearful faces being deported and harrassed. Sadly, Nashville's Big Three TV news media weren't present, at least from what I could see, and from watching early evening newscasts. How sad and telling. If an undocumented worker been arrested, or immigration officials had conducted another raid of a worpklace, or some fool in Spring Hill was protesting his son's class singing a national hymn in Spanish as a class project, or some silly politician and his narrow-minded friends propose a ridiculous referendum about the obvious of speaking English but the unnecessary hate of a mandate or someone had complained about Electrolux in Springfield hiring undocumented workers, then the stories would have led the newscasts..
Ironically, NewsChannel 5's anchor on Sunday was reporter Scott Arnold, who used several days of airtime to chronicle the wrongs of Electrolux and undocumented workers and their families on the pitiful souls of native folks in Springfield. Yet Arnold apparently couldn't bother to drive only a few miles to Our Lady's and bring a camera for a few seconds of Hispanics in a positive light on Sunday evening's newscast. Positive news about Hispanics and amazing stories of giving across ethnicities aren't considered newsworthy. Instead, we have to hear about a Titan player being arrested for DUI and people being killed on a railroad and a Goodlettsville man stabbing his roommates. God help us. No wonder people are deserting the mainstream news media. Mr. Arnold, people want stories of hope, and you and your colleagues missed a big story of hope -- and achievement over adversity -- Sunday afternoon. Don't complain that you didn't know. If you didn't know, then you are either not trusted by the Hispanic community to be fair or you're not interested in being connected to a people who live just a few miles from your station. It is your viewers' great loss, because Elizabeth inspired Vita and vice versa. Elizabeth's Spanish teacher told her students about the plight of Our Lady's and Hispanic families in Nashville from reading my column on John Lamb's provocative website, the Hispanic Nashville Notebook. The column included mention of Vita's initial gift of $3,000 to Our Lady in honor of her marriage to Natalio Chavez more than five decades ago at a church of the same name in a Topeka, KS, barrio. So on the last day of school, Elizabeth brought $7 from her piggybank and gave it to her teacher. Elizabeth left a lot of adults on the Dominican Campus in tears with the purity of her gift. In honoring Our Lady, she also answered Pope Benedict's appeal to Americans to protect our immigrant brothers and sisters. Our Lady's in Nashville is the largest Catholic church in the diocese and Tennessee, says the Rev. Joe Pat Breen, pastor of nearby St. Edward Catholic Church. The good people of Our Lady's have contributed to save their church -- almost $75,000 -- while still supporting daily operations, staff and services to the community. Parishoners at nearby St. Edward keep giving $3,000 to $4,000 per week for a total of more than $300,000 over the past year. The effort to create Our Lady's is the dream of Father Breen. It was made possible through the generosity of the late Rev. Paul Durham's family that offered the land and buildings for less a third of their appraised value. Breen and Durham were good friends. Finally, it took the generosity of three local Catholics who put up the $1.5 million a year ago to allow time for fundraising. They've also paid an additional $70,000 in interest costs over the past 12 months. Those three Catholics come from St. Henry's, The Cathedral and Christ the King. They're being repaid so they can spread their giving to others in need. Our Lady's is more than a church, or a "temple" as to the Holy Mother's wishes almost five centuries ago. It is a place of refuge for a people beset by politics and demonization from the heinous 287(g) deportation program enacted by Davidson County Sheriff Daron Hall and supported by U.S. Rep. Jim Cooper, Rep. Marsha Blackburn and Sen. Lamar Alexander. Within Our Lady's walls, no one is a stranger and love and compassion are unconditional. As the greatest American in our history -- the Rev. Martin Luther King, Jr. -- said: "Anyone who lives inside the United States can never be considered an outsider anywhere within its bounds." I realize my African-American brothers and sisters in Nashville know what it is like to mistreated and persecuted and your good news ignored by the mainstream news media. Let us join in our suffering and support one another in pursuit of justice for all. Perhaps we can do it in the upcoming general election. We'll come to your churches or host you in ours; we're united by the same God and cause. For Our Lady's, we're still $400,000 short of the goal of $1.5 million to pay off the church's debt by June 30. Just to get to this point, besides the giving of Elizabeth and Vita, we have been very blessed. A stunning $100,000 donation came from St. Philip Catholic Church in Franklin and the good Father Kirk. Holy Family Catholic Church and the good Father Alberts in Brentwood gave $25,000 despite being in the middle of their own building project. God bless both congregations. How that's for crossing county and ethnic lines as Our Lady of Guadalupe promised? The good sisters at the Dominican Campus in Nashville have given $500. And they are the ones who are educating Elizabeth, besides her fine parents. Am I not here, I who am your mother? Are you not in my shadow, under my protection? Am I not the fountain of your joy? Are you not in the fold of my mantle, in my crossed arms? Is there anything else you need? Father Breen has successfully talked with the diocese to make a loan available to Our Lady's after June 30. Technically, Our Lady's is now saved. But it is not the best situation. The good people at Our Lady's really do not earn enough for the church to pay for its operations and social services -- and pay off a $400,000 loan each month. That's why we are praying over these last seven days for more gifts from $7 to $7,000 to make the loan payment more affordable. Catholic Charities under the leadership of Nashville attorney Gregg Ramos will be opening an office at Our Lady's. That's positive news to start these last seven days. In the coming week, we must not fail extraordinary people of faith such as Elizabeth, 6, and Vita, 81. In the early morning hours of June 7, on her mother's birthday, Vita Hernandez Chavez slipped away in her sleep under the watch of Our Lady to be reunited with her three sisters and Mama in heaven. Her devotion was rewarded. She is missed desperately by those who adored her, including me, her son. She remains a marvelous mother and friend, who got me involved in political writing. Her faith and devotion to Our Lady also remain alive in Elizabeth, who by God's grace and loving parents has many more decades of giving to inspire. With Vita gone on to her eternal reward, Elizabeth now looks to us and how we will respond to their gifts from the heart. For these two marvelous souls from different cultures but one love of God, please consider giving to Our Lady's and build on the miracles of hope and faith for a better Nashville and world. * Go to www.stedward.org. On the left side of the home page is a box labeled "Our Lady's". Click there and you can view a presentation about the church. Or you can go directly to a credit card form to donate. * If you want to use mail, send your contributions to St. Edward Catholic Church, 188 Thompson Lane, Nashville, TN 37211. On a bottom corner of the envelope, write "For Our Lady's". * Checks should be made out to St. Edward Catholic Church but put "Our Lady of Guadalupe" in the "memo" part of the check. * If you would like someone to come to your organization or place of worship to speak about Our Lady's and answer questions, please e-mail me at timchavez787@yahoo.com. I'll be there at any time, day or place, for Catholics or non-Catholics, believers or non-believers. All are good people. * If you can't give, you have our prayers that God will bless you in your difficult times. Remember, Our Lady of Guadalupe is there for you, too. Photo of Virgin by Chris Short. Licensed under Creative Commons.